This Black History Month, take a look back at important moments and achievements of African-American Texas A&M University students, faculty and staff through the years. The gradual move toward an integrated Texas A&M University began in 1954 when the U.S. Supreme Court ruled unanimously in Brown v. Board of Education of Topeka, Kansas that segregation in public schools was in violation of the Constitution. In 1956, the Texas A&M Student Senate passed a resolution opposing segregation, but the student body voted in favor of continuing segregation. Three years after the student senate vote, Texas A&M hired World War II hero and former student Gen. Earl Rudder as president. Years later, Rudder would be credited for providing the necessary leadership in laying the groundwork for integration. Three years after Rudder’s hiring, the Texas A&M University System Board of Regents decided to “admit qualified students regardless of race” to Arlington State College in 1962. In 1963, three black students enrolled in a summer session, becoming the first to attend Texas A&M. The passage of the Civil Rights Act in 1964 officially brought an end to segregation in southern higher education. Soon after, five freshmen men became the first black students in the Corps of Cadets. Three years after Texas A&M opened its doors to all students, Curtis Mills became the first black student to receive an athletic scholarship and quickly ran his way into the track and field record books. Between 1968 and 1971, Mills set 11 school records, won seven Southwestern Conference titles and was a four-time All-American. In 1979 he became the first African-American inducted into the Texas A&M Athletic Hall of Fame. Around the same time, Mills’ fellow track teammate Hugh T. McElroy also tried out for the football team in 1968. He eventually became the first African-American to start for the football team in 1971. Black Aggie athletes continued to break barriers through the 1970s. Toward the end of the decade in 1979, sisters Ellen and Evelyn Smith and Early Douglas became the first black women to join the track team. The Smith sisters each earned All-American honors. James E. Johnson grew up and attended school in Rockdale and was accepted into Prairie View A&M in 1944, where he earned a bachelor’s degree in education. During that time, he was drafted into the Armed Forces and performed police duties in the Army until he was honorably discharged in 1948. He returned to Prairie View in 1948 after his discharge and finished his bachelor’s degree. Between teaching vocational agriculture for Bryan ISD, raising a family alongside his wife Katie Francis Thomas and working his farmland, he found time to earn a master’s degree from Prairie View in 1962. Johnson applied to Texas A&M in College Station multiple times from the 1940s through the 1960s, but was turned away because of segregation. Johnson applied again and was finally admitted at Texas A&M after the school was integrated, and earned his doctorate in education in 1967. Change continued to come in the early years after integration with the hiring of Texas A&M’s first African-American professor, Dr. Roscoe W. Lewis. After seven years of teaching biochemistry and biophysics, he was awarded the Distinguished Achievement Award in teaching in 1977 by the Association of Former Students. In 1984, the Texas A&M System Board of Regents awarded him the title Professor Emeritus, the first African-American to receive the honor. Women at Texas A&M made history in two ways at Texas A&M in 1974. That year, women were accepted into the Corps of Cadets for the first time. Among the group was the first African-American woman to join the Corps, Gail. Y. Sedberry, who took on a prominent role in the special unit of women, W-1. Fred McClure broke new ground for student leaders during Texas A&M’s centennial year when he was elected to serve as student body president for the Student Government Association’s 29th session for 1976-1977, becoming the school’s first black student to hold the position. In the years after graduation, McClure served as associate deputy U.S. attorney general, a special assistant for legislative affairs under President Ronald Reagan and assistant for legislative affairs under President George H.W. Bush. For his achievements, McClure was honored as the 115th Texas A&M Distinguished Alumnus in 1991. He was also appointed to the Texas A&M University System Board of Regents in 1995, becoming the second African-American to hold the position. In 2012, McClure was selected to serve as chief executive officer of the George H.W. Bush Presidential Library Foundation. He now serves as the executive director of leadership initiatives at the Office of the Provost at Texas A&M. Dr. Grace Butler Chisolm came to Texas A&M in 1983 and became the first African-American woman to achieve the rank of full professor. In 1985 she was named special assistant to Texas A&M President Frank Vandiver – the first African-American to hold such an influential position in the school’s administration. Bastrop, Texas native Ronnie McDonald won a student body election in 1991 to serve as the school’s first black Yell Leader. In 1992, he successfully ran for senior Yell Leader. After graduation, McDonald became Bastrop County’s first black judge, and in 1998 at age 27, the youngest county judge in Texas history, where he served for 14 years. He returned to Texas A&M in 2013 to serve in the role of executive director of community relations and strategic partnerships for Texas A&M AgriLife. He now serves the Texas Rural Leadership Program as its executive director. Callaloo, which has been headquartered at Texas A&M since 2001, is the only journal of African Diaspora literature and art of its kind continuously published for as long a duration under the direction of its founding editor. The journal has published the work of many acclaimed writers, such as Pulitzer Prize-winning poets Gregory Pardlo and Gwendolyn Brooks, but the journal has also helped to launch plenty of successful careers. One such career belongs to Pulitzer Prize-winning poet Natasha Trethewey who was named the 19th Poet Laureate of the U.S. in 2012. Almost 50 years after the integration of Texas A&M, former Marine Marquis Alexander was selected commander of the Corps of Cadets, the first black student to hold the highest cadet position. In addition to being the first black Corps commander, he also became its first veteran leader after having served in the Marine Corps prior to enrolling in Texas A&M. Texas A&M added to its rich military history in 2013 when Medal of Honor recipient and class of 1973 graduate Clarence Sasser returned to his alma mater to put his medal on permanent display in the MSC’s Medal Hall of Honor. Sasser is the first African-American medal winner to be inducted into the hall and the first who served in the Vietnam War. Sasser, a medic during the war, performed his heroic action while helping evacuate soldiers after a helicopter crash. Under heavy enemy fire, he managed to carry one of the soldiers to cover and helped carry others to safety. During the 2013 ceremony, Sasser thanked the late Gen. Earl Rudder, president of Texas A&M from 1959 to 1970, for offering him a scholarship and giving him the opportunity to attend Texas A&M. Rebecca Hankins, a curator and archivist for Africana Studies, Woman’s and Gender Studies, and Arabic language, was appointed by President Barack Obama to serve as a member of the National Historical Publications and Records Commission. Hankins oversees collections housed in Cushing Memorial Library and Archives and assists with diversity campaigns and exhibitions. 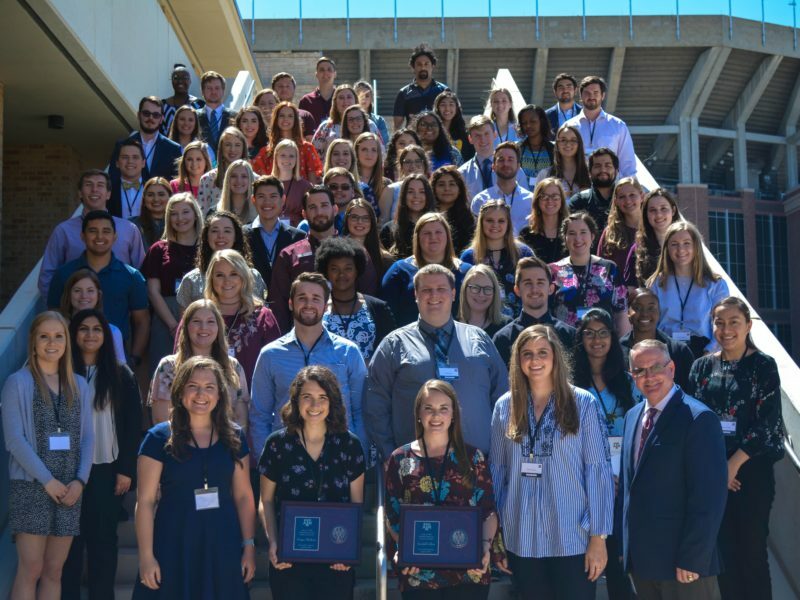 Nearly 700 students from across the country convened at Texas A&M for a weekend of fellowship and professional development at what has become one of the largest student-led collegiate events in the United States, now in its 30th year. The 2018 SBSLC theme of “A Legacy in Living Color” celebrated decades of the vibrancy of the black community at Texas A&M that has spanned three decades. To learn more about Texas A&M’s history of diversity and inclusion, view the Texas A&M diversity timeline, the Office for Diversity, or In Fulfillment of a Dream by Texas A&M University Libraries.